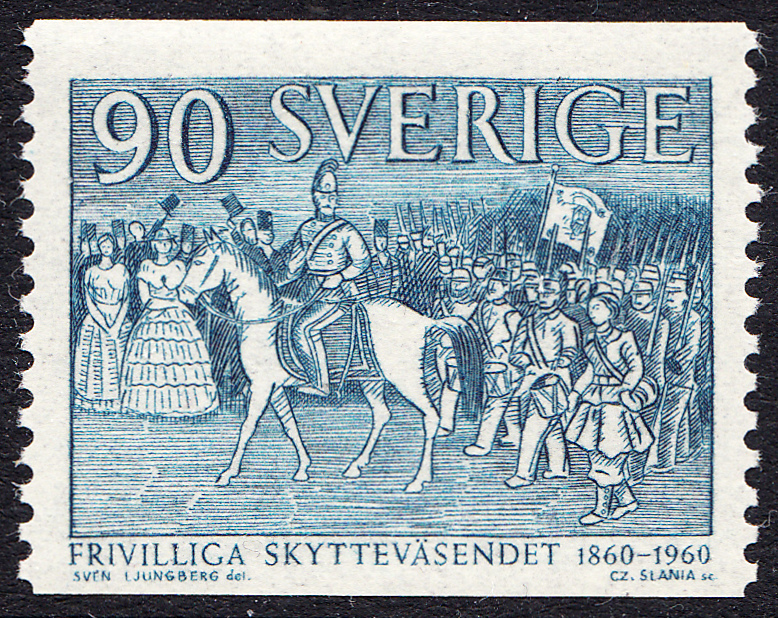 In 1860 the idea of creating volunteer rifle forces in Sweden was born. Local volunteer-corp quickly formed, and these were so popular that by 1864 over 40,000 volunteers were involved. The idea behind this was to create a trained reserve of voluntary troops for homeland defence. But due to organisational issues the movement gradually fizzled out. However, by 1893 the system was reorganised. Rifle clubs for local defence were created in many towns throughout the country. By the end of 1901 there were 1334 rifle clubs with 91,337 members. Eighty-five percent of these members were liable for conscription service. The rifle clubs, it seems to me, kept the public well practised in the use of firearms. This whole idea isn't something I personally agree with, being strictly anti-gun. But that's just my view. And not really the point of the blog. On 30 June 1960 Sweden issued a set of two stamps commemorating the centenary of the Voluntary Shooting Organisation. 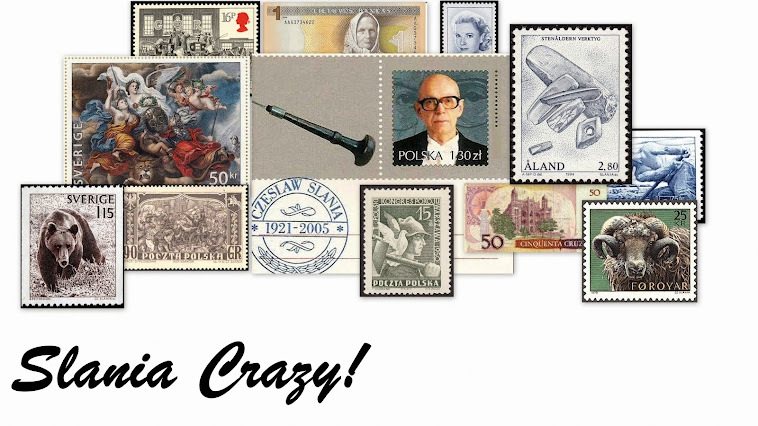 One of these stamps - the 90o value - was engraved by Czeslaw Slania. It depicts a parade of riflemen. 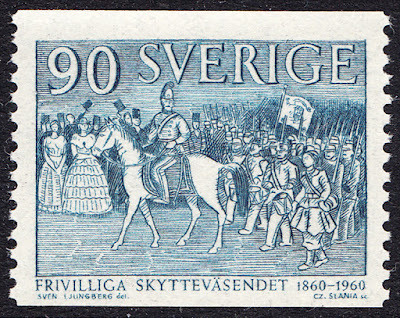 This stamp was issued in horizontal coils. It is a lovely design, and contains one of Slania's favourite subjects - a horse. 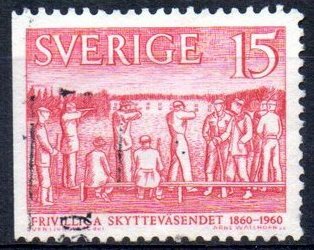 The other stamp in this set was engraved by A. Wallhorn, and it depicts riflemen at target practice. 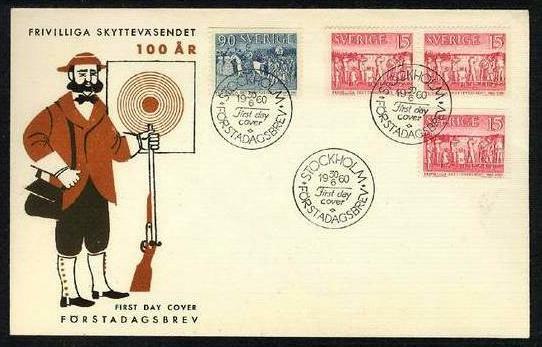 While doing research for this blog I also come across a rather lovely cover that includes both stamps.